Pectoral muscles, which are often known as the pecs, are important muscles which connect the chest muscles with upper shoulder and arm bones. These are the deep muscles which need regular workout for building flexibility and strength. It is important to pay attention to these muscles, as they make up for a bulk of chest. These muscles help to flex, to extend and rotate the arms and shoulders. Including specific exercises in your regular fitness schedule, helps in improving strength, muscle mass and contributes towards powerful muscles. This is an effective exercise which helps in developing abs, triceps, chest muscles and shoulder muscles. It also helps in stabilizing the core muscles. It helps in building harder and stronger pectoral muscles, especially for bodybuilders and weightlifters who need strong and powerful muscles. To do this workout, you need to start in a pushup position. Keep your left hand just under the shoulders. Now, completely extend your right arm and position it straight by your side. You need to place your hand on the medicine ball or a low step. You will then need to bend the left elbow and slowly lower the chest down towards the floor. Your bodyweight at the time shall be on the left hand. As your chest is positioned just above floor, you will have to push your body up. You need to do all the repetitions on a side. You can again switch sides. You need a pair of dumbbells for the workout. You need to rest these on your thighs. Now, you can lie down on a flat bench. Use the thighs, so that you are able to push these dumbbells just above the body, as you completely extend the arms. Your arms shall be at least shoulder distance apart. You need to ensure that your palms should face inwards and towards each other. The dumbbells need to be touching. This shall be your start position. Start gradually, as you lower the dumbbells. You shall twist from the wrists. You need to continue moving your wrists, so that as you reach the bottom, the palms face a bit forward. Now, hold on for sometime. You can push your dumbbells back and get back to the start position. You need to twist at the wrists, just in the opposite direction, as you lower the weight. You need to repeat the workout with a required number of repetitions. This is an easy exercise and suitable for beginners too. Lie down on a bench, as you hold two dumbbells. You need to hold them in a standard grip. Your palms shall face forward. Keep your arms extended over the chest area. 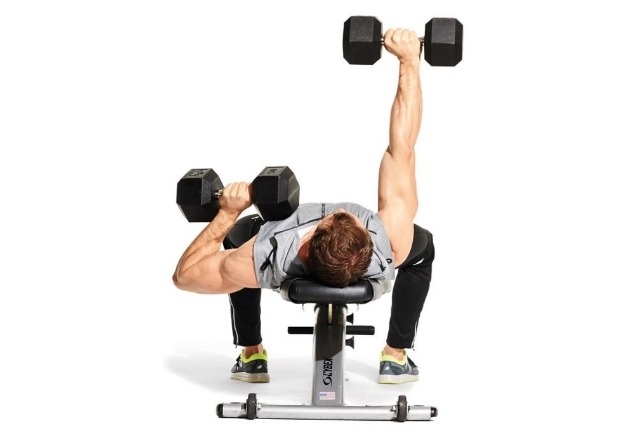 Now, slowly move the dumbbells near the outer chest. You can then press them and rotate these at 180 degrees, as you slowly push back and get into your start position. You can have a supine grip. Your pinkies shall be a bit inward. Your palms shall face the face and towards the top of movement. You need to hold on to this peak contraction position for at least two seconds. You can again lower your body for the next repetition. You need to keep the shoulders back and down so that pectorals movement is maximized. You also need to see that delt takeover is minimized. Cable crossover is often preferred since you can easily adjust the pulleys to any kind of height you wish. Your body and arms shall be stationary when you perform the exercise. The main aim is to maximize the stretch and aso contraction of the chest muscles for each repetition. You need to start the workout by placing the cables in lowest place. You will then grab the handles and then slowly move them in a staggered stance. One foot shall be placed forward and one foot shall be back. You need to lean a bit forward from hip. This shall be the base position. As you have the handles by the sides and using an underhand grip, you need to squeeze these cables up. They should be moved to your eye level with a strong scopping motion. You need to repeat at least 7 times, when in this position. When you add weight to your classic exercise routine, it forces your body to work hard. 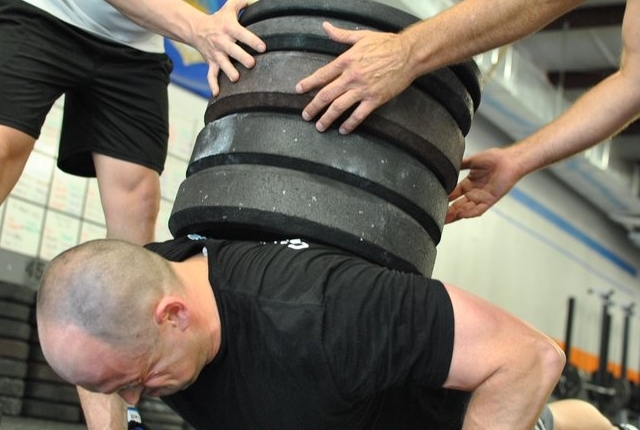 You can add load in the form of plate, sandbag, weight vest and more. Start the workout in a pushup position. You can also use a sandbag on your upper back for getting the weight balanced. Keep your arms straight and your hands shall be a bit wide than shoulders. You need to bend from your shoulders and slowly lower the body till your chest is able to touch the floor. You need to stop for sometime and then push your body slowly upwards.